2014 STATE OF INBOUND MARKETING BY HUBSPOT -- A MUST READ FOR ALL DIGITAL MARKETERS! You don't need to hire that SEO expert. HubSpot's built-in search engine optimization makes it easy to pick the right keywords and find link-building opportunities that increase your website's search rank. Keyword Analysis: Find and track your most effective keywords. Link Tracking: Track inbound links and the leads they're generating. Page-Level SEO: Diagnose and fix poorly ranking sites. HubSpot's blogging software is designed for businesses. It's integrated with the rest of your marketing tools, and it makes it easy to create remarkable content that will help your business get found. Blogging Software and Analytics: Create and measure your blog. SEO Tips: Get automatic SEO tips as you create your blog posts. Content Conversion Analysis: See which of your blog articles are generating the most leads and converting the most leads to customers. HubSpot's blogging software, social media tools and website management system make it easy to create remarkable content that will help you get found. All-in-One Social Publishing: Publish and track Twitter, Facebook and LinkedIn posts from one dashboard. Social Lead Tracking See which of your contacts, leads and customers are engaging with your social activity. Social Lead Nurturing Use your contacts' social activity to trigger or multi-channel marketing automation campaigns. Customizing your leads' experience doesn't have to stop at email. As a marketer, you should be able to control the content and types of offers that your prospects, leads, and customers see on your site. HubSpot 3 gives you the same power as Amazon or Netflix has to segment your leads and choose which offers to show them on your website. This represents a huge step forward for marketers everywhere. Segment: Create dynamic segments based on data and behavior. Customize: Automatically shift your CTAs to reflect the interests of whoever is looking at them. A/B Test: A/B test your CTAs, find out which messages increase clicks and conversions. Landing pages are your best means of capturing inbound leads. And as a marketer, you need to create a lot of them. HubSpot3 makes it even easier to build beautiful, testable, analytical landing pages that are designed to help you increase conversions and drive campaigns. Easy: Easy to create, no HTML required. Build new landing pages whenever you want. A/B Testing: A/B test your landing pages to increase conversions. Design: Beautiful responsive templates that have been tested across browsers and mobile devices..
Analyze: Analyze your landing page conversions and improve your performance. Launch: Use integrations with email and social media to launch campaigns directly from your landing pages. For years, marketers have lacked a single, centralized database. We've had to manage multiple lists, and put up with the need for constant downloading, merging, deduping, and uploading. With HubSpot 3, you'll have the most scaleable, powerful marketing database ever created. No other system lets you maintain and work with all this data. It's the only database you'll ever want or need. Lead Intelligence Timeline: Track every page view & form submission for each and every lead. Social Media: Automatically look up and track social interactions. Custom Fields: Create, capture & upload custom fields. Smart Lists: Build dynamic segments based on each and every field, download, and event. Now more than ever, it's important to send emails that are relevant to your leads. HubSpot 3 is the only email platform connected directly to your marketing contacts database, so it can make your content more personalized and your emails more likely to be opened and acted upon by your leads. Build: Quickly and easily create well designed, effective emails. Personalize: Target specific segments and personalize your sender, subject, and message body content. Design: Build your own custom email templates or use one of our mobile-friendly templates. Analyze: Track delivery, opens, and clicks and maintain engagement records for every contact. As a marketer, your most valuable asset is your marketing database. But your database is only as powerful as you make it. HubSpot 3 makes it easy to build targeted segments and workflows based your contact information, lifecycle stage, and behavior -- which in turn lets you nurture them effectively through your entire sales and marketing process. Segments: Use smart lists to create targeted segments and automatically nurture them. Email: Trigger emails based on downloads, property changes, pageviews, or clicks. Update: Use workflows to update contact properties and add or remove leads from lists. Score: Create customized lead scores based on lead activity. The marketing analytics tools in HubSpot 3 make it easy to calculate the ROI of everything you do in your marketing universe. Every channel and every touch point with your prospects is boiled down to the most important metrics - the number and quality of leads and customers it actually drives - and it all happens automatically. Sources: Track all of your marketing efforts, both online and offline, in one clean, intuitive interface. Events: HubSpot 3's Enterprise package features powerful event-driven analytics, allowing you to easily track even the most granular activities on your website. People-centric: In HubSpot, real people live at the center of your marketing analytics. Build segments and personas, and begin to understand the real people behind the numbers. 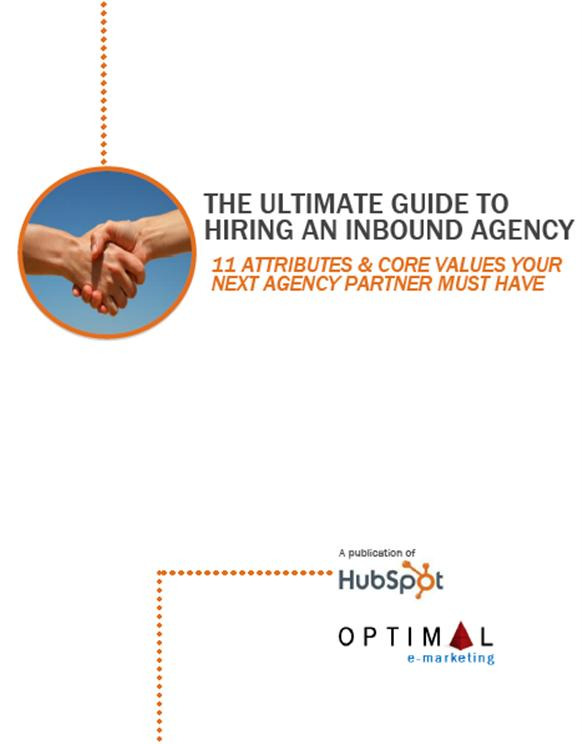 FREE E-BOOK: "THE ULTIMATE GUIDE TO HIRING AN INBOUND MARKETING AGENCY"
For SME, Hubspot Is Highly Affordable! Monthly charges begin at USD$400/month. Concerned about the high costs of CRM and Emailing Software? As a SAAS Cloud-based service, there is no hardware or software to install -- you just need a reliable internet connection. Hubspot webhosting and content management service(CMS), including blogging, are INCLUDED. No other hidden fees from Hubspot! However, these DO NOT include Optimal eMarketing Service fees. More about Optimal eMarketing Services and Pricing. We partner with Hubspot because we believe they have both the PHILISOPHY, COMMITMENT and TECHNOLOGY to make INBOUND MARKETING the Digital Marketing for the next generation of SMEs! HubSpot is an Internet marketing startup whose software helps businesses get found online, generate more inbound leads and convert a higher percentage of those leads into paying customers. HubSpot's software platform includes tools that allow professional marketers and small business owners to manage search engine optimization, blogging and social media, as well as landing pages, lead intelligence and marketing analytics. 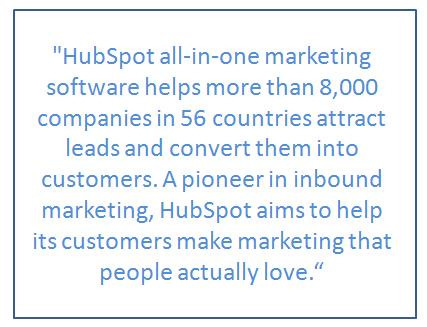 Inbound Marketing is now possible in Singapore with Hubspot! Marketing Automation is here now! HubSpot makes the difficult easy, and the impossible possible. It's the only marketing system you'll ever want or need. Learn more about the concept of an All-In-One Integrated Inbound Marketing Software platform. Optimize your website to get found by more prospects and convert more of them into leads and paying customers-- all in ONE place. No more doing disconnected campaigns and searching for analytics in different places. It's the next generation of affordable marketing software. We can help you get started!